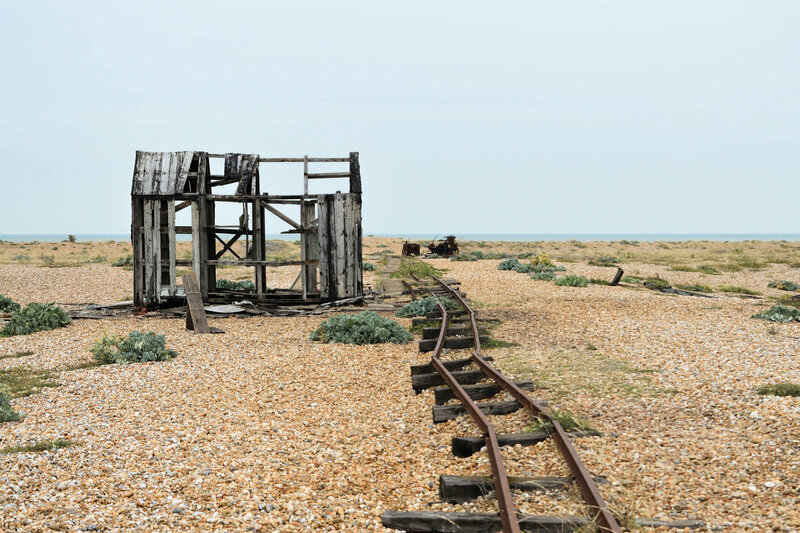 I have been fascinated by Dungeness for a while. Like most people from the area, I travelled there as a child on the little railway from Hythe and Dymchurch. Later it was subject of my A Level art coursework. I came here on my birthday, to make use of the camera I got that year. I even share a surname with one of its most notable inhabitants, Derek Jarman although as far as I’m aware there’s no relation. It’s the mixture of unease and eeriness about the place that interests me. It’s so sublimely desolate and vast, it’s a mixture of a dessert and a beach. I was keen to take Ben and our friend along as they’d never visited and I have trouble describing a place so bizarre, and it really has to be seen to be believed. Dungeness is like a ghost town, for all intents and purposes it’s a dessert, masquerading as a beach. There's a beach hut that’s been destroyed by the weather, you can see where the wind has ripped through it, it looks as if its guts are spilling out. There’s a sort of chimney breast, it looks so bizarre sitting alone on the beach looking out to sea. A plaque explains its purpose, there used to be a blacksmith's here and this chimney is a recreation of one that once existed. As you walk nearer to the sea, you’ll find all sorts of items that have been abandoned or washed up on the shore. The small community of artists that live here utilise these items in their works. Decaying boats and engines are scattered around. An area of shipping containers have been littered with nets, gas canisters, boxes and all sorts of boating items. Another time I’d visited a local artist invited us into his little gallery. Each time he’d finish with a paint brush he’d stake it into the ground, similar to how Jarman arranged the found objects in his garden. When we met him he gave us a brush to put in the ground with the others. The place is an artist’s paradise, with endless inspiration found in the landscape, and resources being washed up on the shore after each big storm. It’s a great place to go and take pictures if you're into photography and filming, having been used for several album covers, and music videos. Near the power stations of which there are two, one working and the other closed. Both have a fairly ominous presence which is part of the fabric of the place. There is a lighthouse open to visitors. There is also the station that the little train stops at, complete with cafe and gift shop. It’s worth noting it’s probably the nearest toilet for miles around, with the exception of the Pilot Inn pub who serve the fish and chips Derek Jarman loved. Knowing about the lack of food options available we’d packed our own sandwiches and snacks for the day. The wind and rain swept across the beach on that July day and our car windows steamed up as we dried off and ate our lunch, something anyone holidaying in England will be familiar with. 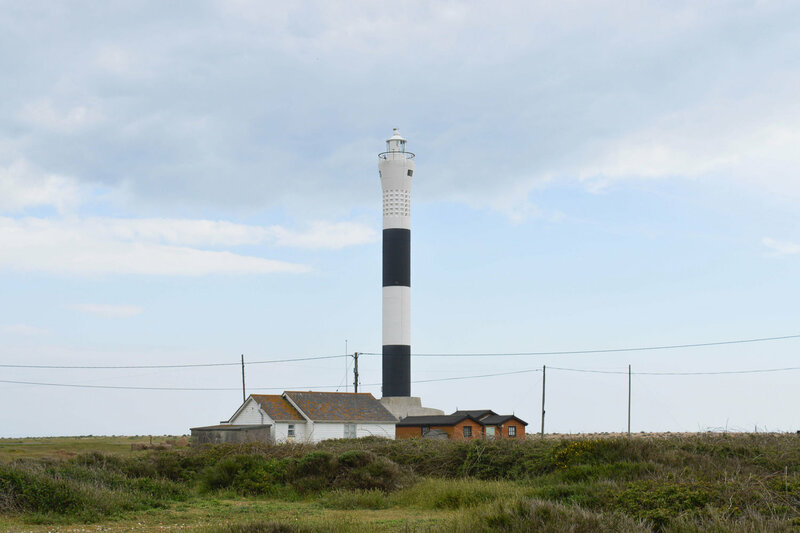 The atmosphere of Dungeness is a draw for many people who visit. 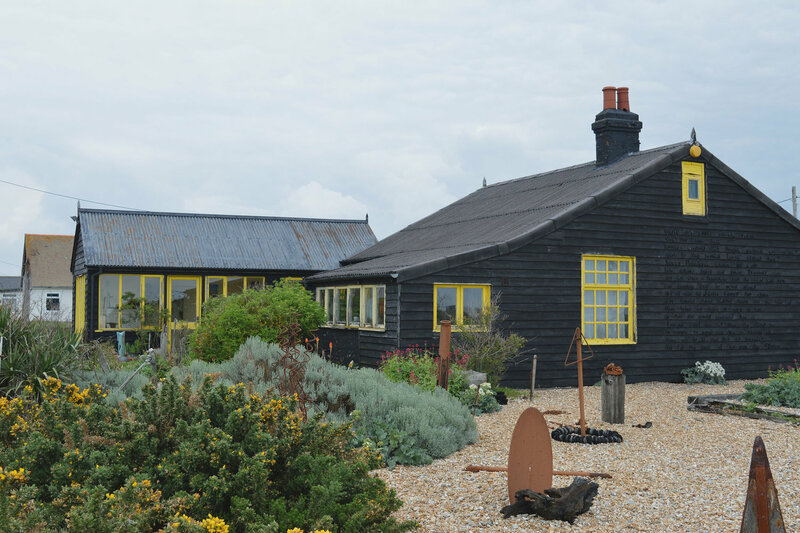 Artist and director Derek Jarman bought Prospect Cottage where he would spend his final years. Jarman treasured the peace and tranquility he found at his beloved “Ness”. A keen gardener, he found purpose in building up his garden with found objects and wild planting. 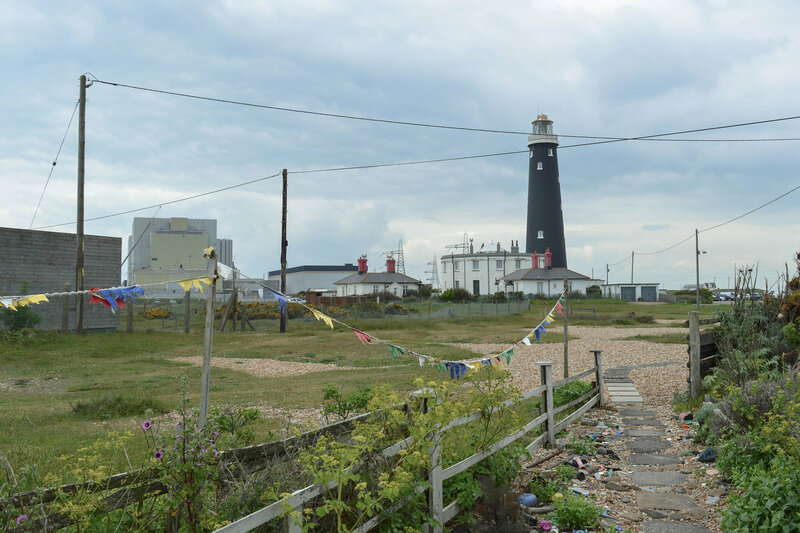 Jarman’s garden is now synonymous with Dungeness. 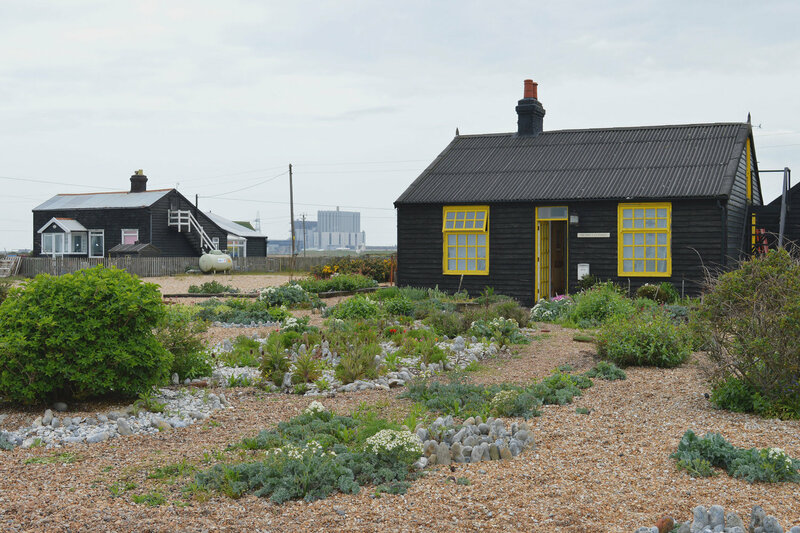 Visiting his garden is a must if you come to Dungeness. Prospect Cottage is one of the first of many black wooden houses on the road, the tar wood paneling of their exteriors give a scandinavian look, one of the many alienating features that make you feel as if you’ve entered a foreign realm. It’s difficult for conventional garden plants to survive with so much salt in the air and high winds. Ones that do tend to be rubbery sea kale or wildflowers that thrive among the shingle, these are the plants that are found in Jarman’s famous garden. There are no flower beds or lawns, in fact Jarman wrote of his hatred for lawns as they take up space that can be planted up with flowers or vegetables. He made use of his surroundings by collecting various objects and creating intrigue in his garden. Rusted shapes of metal, driftwood and pieces of flint are placed in the shingle with reverence as circular lines are carefully raked around them. The garden is open to the public, in fact you can just stroll right up and most people park up on the road and walk across. It feels a little odd just walking into someone’s garden, but that's the way things go here. It’s a small area that’s lovingly tended to. A curated landscape contrasting the wild and foreboding scenes around it. We left and headed back to the motorway for Deal. It feels like going back to civilisation after visiting the desert. It’s almost a sense of relief, from the vast landscape and from the beating wind. But there is always something that calls me back, and I can't help but imagine a quiet life tucked away in a little cottage, tending to my garden. If you’d like to find out more about Dungeness and Derek Jarman’s garden, then I’d recommend this book which is full of beautiful photography and personal reflections from Jarman.